Episode 38 - The Sage Markandeya continues with his storytelling. He begins with his own version of the Four Ages or Yugas. One interesting point is that in his reckoning, the Kali Yuga lasts 1,200 years in total. 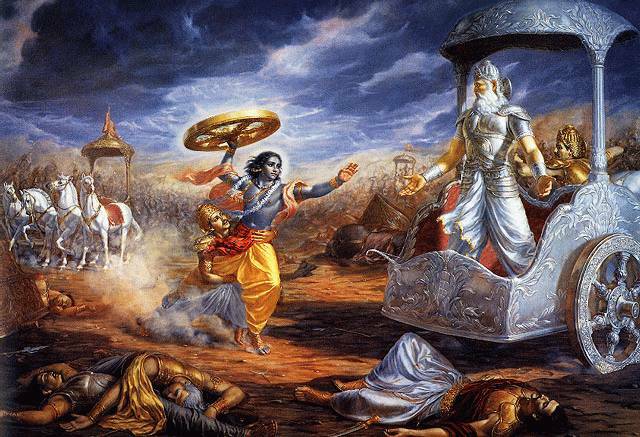 Since we are told elsewhere that the Kali Yuga began for us on the death of Krishna, then the Kali Yuga must have ended centuries ago, and we happy people have made it into the next Golden Age! After an apocalyptic vision of the future, Makandeya gives us the Tale of the Frog, which culminates in a showdown between the brahmin Vamadev and a pair of stubborn kings. The brahmin, of course, comes out the victor! I heard them all. All the best and hope you make more. I also suggest you to make some more podcasts of other Indian epics. Having not been raised in that culture...sometimes I feel that you bring in a fresh perspective, esp your comments on Bhishma were very interesting. Give me a link to 'like' this on facebook, itune etc and I can do it.